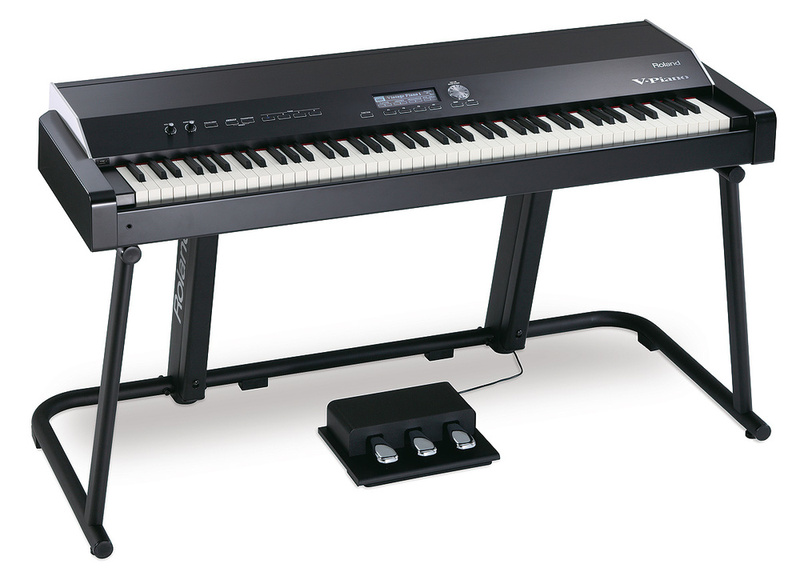 Unless you've been away mining dilithium in a distant galaxy for the past year and a half, you'll be aware that the V‑Piano is Roland's flagship digital stage piano (originally reviewed in the May 2009 issue of Sound On Sound). It's also the first such instrument from that company to generate piano sounds entirely by physical modelling, a method that brings numerous advantages when recreating the highly complex sound of an acoustic piano. While modern sampling technology has produced some extremely fine‑sounding digital and virtual pianos, they are inherently limited by the very nature of samples. As good as they might sound, samples are essentially just snapshots of the sampled instrument. Aside from processing the sound in some way, there is nothing much you can do to change the samples' fundamental nature. The unison tuning of the strings is cast in stone, as are the soundboard resonance, hammer hardness, soundboard length, the materials from which the piano is built, and many other factors that define the character of the instrument. Physical modelling, on the other hand, allows all of these defining factors to be altered — and not just globally for the entire piano, but in many cases, such as unison tuning, hammer hardness and cross‑resonance, on a per‑note basis. The V‑Piano allows for exactly this sort of detailed editing, enabling the user to create customised piano sounds with a unique individuality. Whether you want an unloved, poorly maintained parlour piano or a pristine concert grand, it's possible to design it with the V‑Piano. The piano models in the V‑Piano are designated as either Vintage or Vanguard types. The Vintage models represent recognisably real‑life pianos of two types, built from standard materials. Vintage 1 (the 'American' model) is the brighter and more full‑bodied of the two, while Vintage 2 is the 'European' model, having a rounder and plummier tone. The Vanguard models are Roland's 'non‑real world' creations, using unconventional materials such as all‑silver strings, glass soundboards, triple strings across the entire instrument and other exotic variations. As Charles Darwin might have said (but possibly didn't), 'diversity is progress' — and to progress, things need to evolve. Hence Roland's move to introduce the first V‑Piano upgrade, together with a crafty re‑branding. Meet V‑Piano Evolution. The Evolution upgrade is a free download from the Roland web site. The installer itself consists of a number of files that need to be copied to the root level of a USB drive. Installation is a two‑part process: firstly, the V‑Piano reads the files from the USB drive inserted in its rear connection, then a second reading is taken via the front-panel USB connector. The whole process takes around 15 minutes to complete. The V‑Piano Editor software also needs to be updated to version 1.1 in order to be Evolution compatible. I had expected there to be some changes or additions to the editor software, but it appears to have identical functions to version 1.0. Once installed, the V‑Piano gains four new models, occupying Presets 25 to 28. Other than that, all the V‑Piano's functions remain as before. Vertical (Upright): This model has a distinctive character with a warm tone, a suggestion of room ambience, and a subtle detuned quality. In its default state it sounds rather like a very expensive, well‑maintained upright — a little too perfect, perhaps. However, by using the editor to draw a random unison tuning curve across the keyboard, generally increasing the various resonance parameters, shortening the string decay time and adjusting the tone colour, it's possible to create a believably 'trashy' old upright such as might grace the living room of many a suburban home. V1 Impactance: Based on the Vintage 1 model, this variation has heavier hammers (which apparently increases the perceived weight by 50 virtual grams), to provide a more percussive sound suitable for styles such as Latin, where the piano needs to cut through the mix incisively. Triple Large: One of two new 'Vanguard' models, this combines triple strings across the entire range with an extra‑large extended piano body. This is darker toned and slightly louder than the All Triple model, with a very powerful low end and exceptionally long sustain. Metallic SB: This Vanguard model is based on the All Silver model, and features "a new virtual soundboard made of thin metal boards sandwiched between thin wooden boards”, imparting even more upper harmonic detail to the already shiny tone of the Silver model. This is especially prominent in the low range. In terms of strictly studio use, the V‑Piano faces stiff competition from Modartt's Pianoteq software, not least due to the gargantuan price difference, given that the V-Piano's street price is around £4500$5999. In terms of evolution, Pianoteq has come on in leaps and bounds, offering many different modelled keyboard instruments (or, more accurately, instruments based on a keyboard format with a chromatic scale) such as vibes, marimba, electro‑mechanical keyboards and harpsichord. It's taken Roland a while to come up with their first upgrade to the V‑Piano; nevertheless, it's encouraging to see that there is active development going on. Keyboard models aside, there are other areas that the V‑Piano could address — for example, the V‑Piano's models are all very 'dry' and 'close'. Variable virtual mic positions would provide even more tonal control, as well as injecting a sense of ambience and listener perspective that is never quite as effective using reverb alone. In terms of live performance, the V‑Piano is still the only choice for a hardware physically modelled piano — although its luxury price point no doubt makes the considerably less expensive sampled alternatives a more viable option for many. It's possible that Roland are adopting a 'purely piano' stance for the V‑Piano, producing new models that build on that core concept. Nevertheless, keeping pace with the competition may be the only way to increase the range of prospective buyers. Let's hope that the Evolution programme itself evolves, bringing even greater diversity to this great musical instrument. Modartt's Pianoteq software continues to be the only purely physically modelled alternative to the V‑Piano, with an ongoing development programme comparable to Evolution. The nearest sample‑based equivalent to the Evolution concept is Nord's Stage Piano, for which the user has access to a downloadable, growing library of alternative pianos that can be installed in its flash ROM to supplement or replace the originally installed ones. Somewhere in between these lies Roland's own SuperNatural piano sound engine, which is a hybrid of sampling and modelling, as found on their RD700NX keyboard. Four new piano models extend the V‑Piano's sound palette. The Vertical model is a particularly welcome addition. Models representing other members of the keyboard family would have been a significant step forward. The V‑Piano itself is still very expensive. The V‑Piano's first upgrade adds four new piano models to the collection offered by this top-flight instrument. While perhaps not radically different from the original models, they are a promising indicator of things to come.